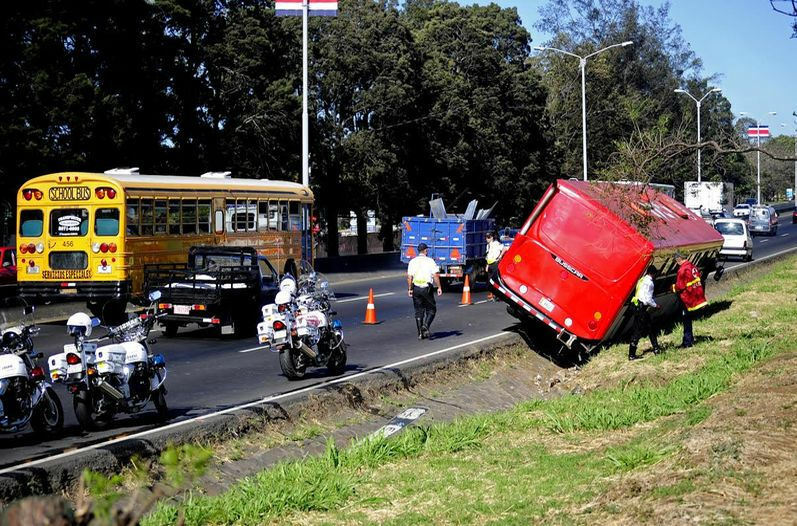 QCOSTARICA – A total of 12 passengers traveling in a bus from San José to Alajuela were taken to hospital after the public transport landed in a ditch on the autopista General Cañas in front of the Los Arcos. The director of the Policia de Transito (Traffic Police), Mario Calderon, confirmed that the driver of the bus was driving under the influence, blowing 0.51 in a roadside breathalyzer test. The legal limit is 0.38 for drivers of public transport. The accident occurred at 7:58am, according to Alexander Porras, dispatcher at the Cruz Roja (Red Cross), who said eight ambulances from Heredia and San José were sent to the scene of the accident. The injuries were not serious, however, the passengers were taken to hospital for medical evaluation. Calderon explained that the driver of the bus owned and operated by TUASA was among the injured. The director added that at hospital a blood test was performed to support the police the report of intoxication that is being used to file charges with the Fiscalia (Prosecutor’s office). “It is an irregular situation … it was an irresponsible act of the driver who should have informed his superiors he was not able to drive,” said Calderon.